Children’s picture books about death: Lifetimes, Alfie and the Birthday Surprise, and more. Picture books that explain death to children. Last year, when my daughter Eliza was 3, we went to stay with my in-laws for a week. About two hours into our stay, we discovered that we had neglected to bring enough books. (For her, that is; I had brought three for myself and didn’t finish any of them.) So, while everyone else was otherwise occupied, Eliza and I went to a bookstore. As we were leaving the children’s section with our picks, I noticed a few volumes from Shirley Hughes’ Alfie series on a shelf. We had previously read some of these gentle English kitchen-sink comedies about a little boy and his family when friends brought them on vacation. I remembered liking the illustrations—proper art-school drafting, nice scratchy lines—and the proletarian British idioms (“her Maureen”). So I grabbed one and added it to our stack. It was called Alfie and the Birthday Surprise. If you had asked me to guess the plot of Alfie and the Birthday Surprise, I would have said that it was Alfie’s fifth birthday, and that he had his heart set on a new bicycle, and that for most of the story it would appear that he was not going to receive the bicycle, but at the end he would receive the bicycle after all. When, reading the book aloud, I came to the part about Smokey’s death, I considered doing some on-the-fly editing of the sort that most parents do—perhaps Smokey could get hurt instead? But we were only a few pages in, and the death was clearly a major plot point, and I wasn’t sure I could improvise a whole new story around the illustrations. So I read the text as written, feline funeral and all. We were sitting in the upstairs bedroom at my daughter’s grandparents’ house. It was very quiet when I finished. “What happened to Smokey?” Eliza asked. Children have to find out about death at some point. It’s a cognitive milestone, like naming colors or counting to 10, only horrible. I don’t know how I had hoped the conversation would go, but I would have liked to be a bit more prepared. Even five minutes reading parenting blogs would have helped. Explaining to your child that existence is inescapably booby-trapped is hard in two different ways. It’s difficult emotionally, of course: You have to shatter her sense of a benevolent universe. But before you can do that, there’s an expository difficulty: You have to explain what death is. The former is hard to bear; the latter is hard to accomplish. This was too abstract for a 3-year-old. “Where is Smokey now?” she asked, trying to bring me back to the material. One of the recurrent misapprehensions of parenthood (one of mine, at least) is the idea of childhood as an unblemished sphere where, with careful management, we can finally get things right. For a while I was angry at Shirley Hughes for not giving her book a more appropriate title like Alfie and the Death of a Cat, which would have allowed me to avoid the whole mess. 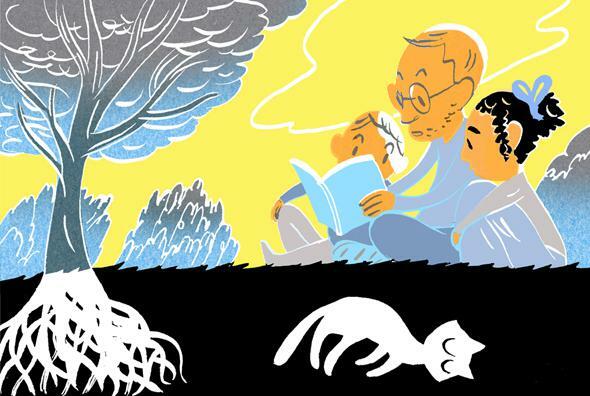 It turns out, though, that childhood is just as chaotic as the rest of life—maybe even more so—and that trying to titrate your kid’s understanding of catastrophe is a fool’s errand. About six months after we read Alfie and the Birthday Surprise, our dog contracted a bacterial infection that caused her organs to shut down. So we had to euthanize the dog, and then we had to explain to Eliza what had happened. We could have told her that the dog had gone to live on a farm, like parents in a sitcom. We didn’t consider that course of action because, questions of honesty and respect aside, she would have asked to visit the dog every day, and we would have said the farm was too far away to visit, and she would have insisted that no farm could be too far away for us to visit our beloved dog, and I would have agreed with her, and eventually I would have started asking my wife why we couldn’t visit the dog on the farm. Eliza was devastated, of course, but at least she knew what we meant when we said that the dog had died, so we didn’t have to go through the whole philosophical colloquy while we were all crying. And then, during the next few weeks, while we were emerging from our sorrow, she asked me to read Alfie and the Birthday Surprise to her. A new round of questions began: What’s under the ground? Can we dig a hole and go into it to see what it’s like there? We tried to answer, but our answers wouldn’t lodge in her mind. So we looked for more books. These books address the emotional difficulty of telling children about death, but not the expository one. The only book I found that tries to tackle that second challenge is called Lifetimes: The Beautiful Way to Explain Death to Children, by Bryan Mellonie and illustrated by Robert Ingpen. Despite the self-aggrandizing subtitle, the book’s voice is calm and restrained. It doesn’t talk about grief at all. Everything that lives has a lifetime, the book says, and that lifetime has a beginning (3-year-olds know this already) and an ending as well (that part is new). This is not happy news, exactly, but it is at least symmetrical, and it points to a way in which life resembles every other experience. There are no characters. The book begins with plants and animals; it informs us that small creatures tend to have shorter lifetimes than bigger creatures. The language is general. The repetition is didactic rather than singsong. Ingpen’s painted images—a fish, a dead tree, a row of seashells—have a reassuring solidity. The effect is to leach some of the horror from the subject, to the point where death becomes mildly boring, like an exhibit at a natural history museum. And then, three-quarters of the way through, there’s a page with just two words. It articulates the question that has been building in the reader’s mind all along: “And people?” The careful, slightly tedious accretion of facts and images, it turns out, were to prepare my daughter for the revelation that she and I, sitting on her bed reading, are part of the exhibit too. It worked, for her, I think, at least a bit. We ask a lot from children’s books. In another time or place or family, a child might learn about death from agricultural labor or religious instruction, but families like mine don’t do those things. Instead, if we’re lucky and have lives mostly free of heartbreak, we introduce the disasters of the world to our children by reading to them. It’s a kind of admission: that there are things I can’t explain to her, questions I can’t answer; that my own tolerance for tragedy is barely adequate. So I read to her and hope that will give her enough to build her own imperfect fortifications, which I like to pretend she’ll never need.